The Tokyo Disney Resort is a dream destination for many Disney fans, and for good reason. With unique rides and attractions, festive seasonal events, and beautiful theming throughout the parks, it’s no wonder visitors to Japan often include a couple of days at Disney. Be sure to bring a healthy appetite as well, because the Tokyo Disney Resort offers some incredibly delicious eats—everything from food carts to high-end restaurants. You’ll find some of your classic favorites like the gigantic turkey legs, but there’s also a variety of unique menu items not found at any other Disney Resort. Here are 10 specialty treats to try while visiting the Tokyo Disney Resort. While churro and popcorn carts are a staple at Disney Resorts worldwide, Tokyo Disney kicks things up a notch and serves Mickey-shaped churros and popcorn in a wide variety of flavors. Look for seasonal shapes and flavors at the churro carts in both Tokyo Disneyland and Tokyo DisneySea. When it comes to the popcorn, flavors run the gamut from the expected to the bizarre. Stick to sweet basics like honey, milk tea, and caramel, or be bold and experiment with unique savory options like herb tomato, soy sauce and butter, barbecue, and curry. Popcorn flavors vary by individual carts, which means seeking out all the flavors in both parks can be an adventure in itself. Collectors of Disney popcorn buckets will want to visit the designated carts selling the latest releases, but be prepared to stand in line. There is such a demand for newly released popcorn buckets in Tokyo that lines can easily stretch 30 minutes or more, especially on the weekends. Fans of Pixar’s Monsters, Inc. and Monsters University movies won’t want to miss trying the Mike Wazowski melon bread at Tokyo Disneyland. Melon bread, more commonly called melonpan, is a traditional sweet bun found In Japan. It’s slightly sweet, but not ridiculously sweet, which makes it perfect for a quick snack, perhaps while waiting for a parade to start. Other options include a wide variety of Mickey-shaped breads and pastries. These are great to purchase and take back to your hotel for a quick breakfast in the morning before heading back into the parks. Be sure not to miss the little green alien mochi dumplings that are unique to Tokyo Disney. If you’ve never heard of mochi, it’s a Japanese rice cake that is pounded into a paste and molded into shape. Each dumpling has a different flavored filling, which is typically custard, chocolate, or strawberry. You can also buy a matching souvenir container at New York Deli in Tokyo DisneySea. Popular breakfast items like Mickey-shaped waffles are available at Tokyo Disneyland. The waffle shop is small, so expect a line, even on non-peak days. The menu is also small, but each waffle is delicious. The everyday offerings include maple syrup, chocolate sauce, and a strawberry and custard flavor. Look for the seasonal waffle, which may feature flavors like apple with caramel ice cream or red bean with green tea ice cream. The Great American Waffle Co. serves up iconic Mickey waffles all day long so you don’t have to rush to grab one at breakfast; perfect for people who want to get a few rides out of the way before stopping for food. One of the unique options at the Tokyo Disney Resort is the classic Afternoon Tea at the Disneyland Hotel. The tea set changes based on season and around various park events (like Frozen), but some of the typical times include Christmas, Easter, and Halloween. These tea sets clearly showcase the creativity and artistic capabilities of Disney’s pastry chefs. Start with four savory finger sandwiches, two scones, and then the stunning dessert platter. Head over during the late afternoon or right around 11:30 to beat the rush. Duffy the Disney Bear is the star of Tokyo DisneySea and his adorable fluffy presence is reflected everywhere in the park. 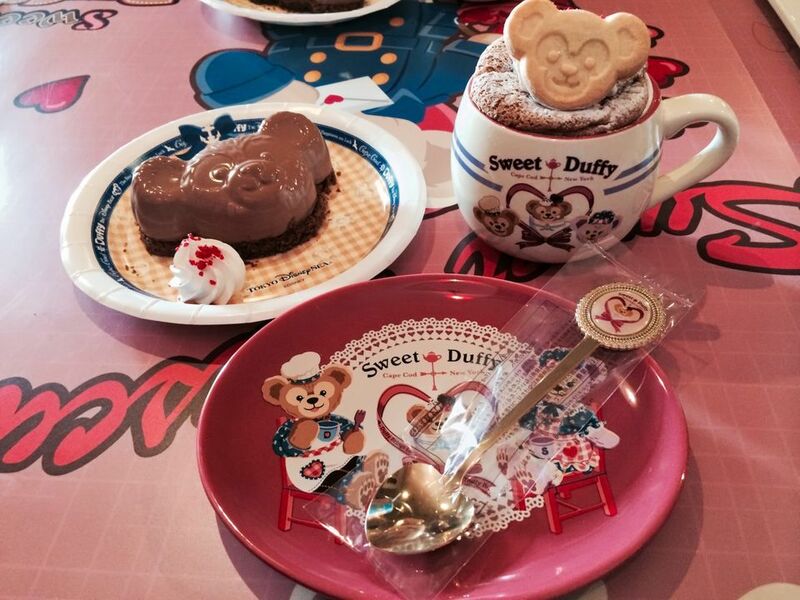 Head over to Cape Cod and order the latest seasonal Duffy dessert—which comes with a souvenir plate or cup. You’ll usually find two everyday offerings on the menu and then the seasonal plate and cup desserts. For around $8 US (depending on current exchange rate), these are some of the best deals in the park as you get a quality dessert and a souvenir to take home. Ikspiari is Tokyo Disney’s version of Downtown Disney. The multi-level shopping center is home to a number of interesting stores and Japanese restaurants, along with some familiar brands like Krispy Kreme. If you’re a fan of doughnuts, don’t miss heading down to the basement and trying their seasonal items and traditional Japanese flavors that you won’t find at Krispy Kreme back home. Steamed buns are popular items in Asian cuisine. Tokyo Disneyland offers Mickey- and Minnie-shaped ones. Buns shaped like Mickey’s ears and head are typically filled with savory ingredients while Minnie’s are usually sweet. Look for seasonal ones too, especially during Halloween when Mickey and Minnie get a colorful makeover. Omiyage is a Japanese term that refers to a gift you give someone after returning from a trip. Individually wrapped snacks are packaged in a brightly colored box or tin, which makes them great for sharing. Tokyo Disney has a mind-blowing selection of what you might refer to as souvenir tins, filled with everything from sweet to savory treats. These collector items fly off the shelves as each new seasonal event starts, and you’ll find entire stores devoted to selling them. Don’t worry, no one will judge you if you keep a few for yourself and enjoy all the delicious Japanese specialties inside. Take a break from rides and attractions and head over to the Disney Ambassador Hotel to try their cake set or dessert medley. This is a great alternative to the afternoon tea at the Disneyland Hotel if you want to try one of the specialty seasonal treats but save your appetite. The cake set comes with tea or coffee while the dessert medley does not. Both dessert options are beautifully executed and are always themed to Disney characters and the current seasonal events.